1. Preheat the oven to 180ºC, gas mark 4. Roll out the pastry thinly on a floured surface and use to line a 23cm deep, loose-bottomed tart tin. Chill for 5 minutes. 2. Meanwhile, place the butter, sugar, eggs, ground almonds, flour, baking powder and vanilla extract in a large bowl and whisk until well blended. 3.Spoon the filling into the tart case then press the plums evenly into the mixture (they will sink into the centre as the tart bakes). Scatter over the flaked almonds and bake for 40 –45 minutes until risen and golden brown. 4. Melt the apricot jam with 1 tbsp water in a small pan. Brush over the top of the tart and leave to cool. Cut into slices and serve. 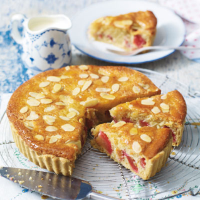 Cook’s tip: Try serving this tart with a drizzle of cream or vanilla custard. This recipe was first published in Wed Jul 24 11:46:00 BST 2013.